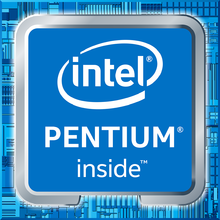 The Intel Pentium 4415Y is a low power entry level processor for small laptops or tablets and based on the Kaby Lake architecture. It was announced in Q2 2017 and offers two processor cores clocked at 1.6 GHz (no Turbo Boost). Thanks to Hyper Threading, the processor can execute up to four threads simultaneously. The chips also includes the Intel HD Graphics 615 GPU, a dual-channel memory controller (DDR3L/LPDDR3) as well as VP9 and H.265 video de- and encoder. It is still produced in a 14 nm process with FinFET transistors. Compared to the much faster Core m3-7Y30, the Pentium 4415 offers no Turbo Boost, different CPU and GPU clock speeds, a smaller L3 cache and a higher TDP of 6 Watt. Due to the missing Turbo Boost, the Pentium 4415Y offers a significantly worse single thread performance than the more expensive Core m3-7Y30. This should be noticeable in daily tasks.